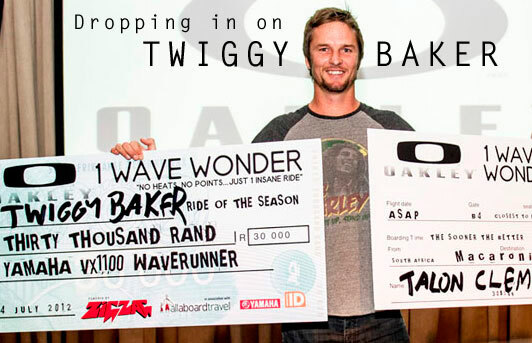 Zigzag: First off, congratulations on your back-to-back Oakley 1WW wins Twig. Going into the last month you weren’t one of the finalists yet, with only one slot left open. Were you stressing? Twiggy: Haha! Contrary to popular belief I don’t base my entire existence around the 1WW. Seriously though, as a professional free surfer it is obviously a major deal to win this event both for personal satisfaction that things are going well and for my sponsors who put a lot of faith and money in me, for that I would like to thank Billabong, BOS Ice Tea, Country Feeling Surfboards, Coreban, Cabrinha , Futures and Fishstix. Without their support I couldn’t do what I do. What was going through your mind when you got spat out of that massive Cloudbreak pit? Actually, what were you thinking even paddling for that monster? At that stage of the game it’s all survival instinct and I was just so happy to have caught one of the set waves, I made it off the bottom and got barreled, nothing else was going through my mind except a huge rush of adrenaline and relief. I actually got spat out right next to Ramon Navarro who had had his game changing wave on the previous set and we sat there screaming at each other in pure joy! After a while I did think, WOW that was a 1WW for sure… haha. 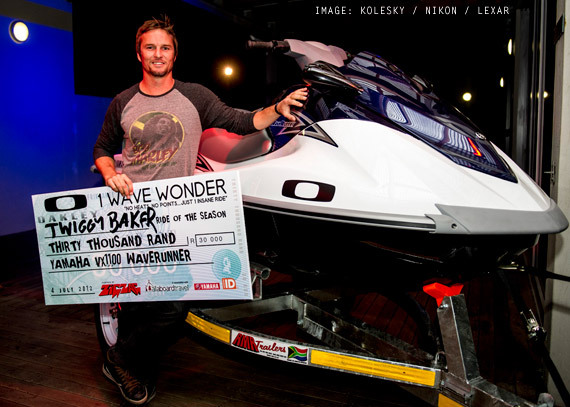 One of the prizes this year for winning the Oakley 1WW was a Yamaha jetski. Seeing as you already have a ski, are you planning on making a jetski catamaran? Haha! Yea, I’ve taken some slack on this one, but it’s always been a problem for us to have two skis available for the big days – one for the surfers to use and one for the camera guys. So now we can have a really slick professional operation and hopefully take what we have been doing to the next level with regards to capturing footage. Okay, on a serious note, what became clear on that day in Fiji is that the surfers we’ve come to call “the world’s best”, weren’t the world’s best in those kind of waves. What are your thoughts on that? Tough question, I think the world’s best are the world’s best and could be in those types of waves if they were prepared. We had all the safety equipment with us as well as the right boards for the job and that made a big difference for sure. What I think can be said about the day is that the big wave guys proved that in a lot of ways they have just as much skill and ability as any of the WCT boys. I haven’t seen the figures, but the live feed from that day must have had one of the biggest audiences ever for a day’s surfing. Surely this must be vindication for the big wave surfers to have their very own world tour, getting paid salaries that the Dream Tour guys are getting? Yes and yes, that’s the dream for the future generations and what we are working towards. Just like professional surfing in the beginning took time to come to fruition so will our big wave tour and hopefully the money involved. Following on from that, what’s next for Twiggy Baker? Just business as usual, trying to stay out of trouble, in the water and enjoying what I do. I’m off to Cape Town today for what looks like the best swell of the winter and then to J-bay to support the saffas in the Billabong Pro, sounds like good times to me. Have you noticed a larger interest in charging BIG waves from the younger crew? For years it seemed like it was an exclusive club for the older surfers, with a few young guns here and there. Now you have guys like Bromley, the Maui crew and even a couple of Brazilian lighties that are out there pushing the limits with you guys! Surfing waves of consequence takes time and patience and that’s why it does sometimes feel like an older crew’s game but it’s because most of the ability in big waves comes with experience. There are some young guys giving it a go and I do believe the swell this weekend could separate the men from the boys in the big wave circle in South Africa. I’ve been itching to see the likes of Frank, Matt and Josh in some really big waves and I think they are finally going to get their chance to prove their worth. We’re excited to see what you have in store for us next Twig, shot for your time and keep charging boet. Thanks to everyone involved in the 1WW and to the public out there who supported us surfers and to Oakley, All Aboard and Yamaha for the amazing prizes. I hope this event just goes from strength to strength in the future. And thanks to Zag for all the support over the years, what would surfing in South Africa be without you guys?